Will these control arms work on a lowered mustang? 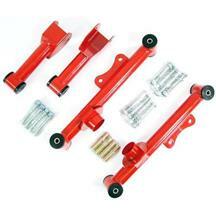 They replace the stock arm and use the stock springs so if your pony is lowered will work. I have the Ford Racing lowering spring on my GT Convertible and they worked fine. The only issue might be if you were trying to drop it on the ground with bags.